Black over red 3-8 was a male peregrine falcon that was hatched on a railroad bridge that crosses the Elizabeth River in Norfolk, VA, in 1993. 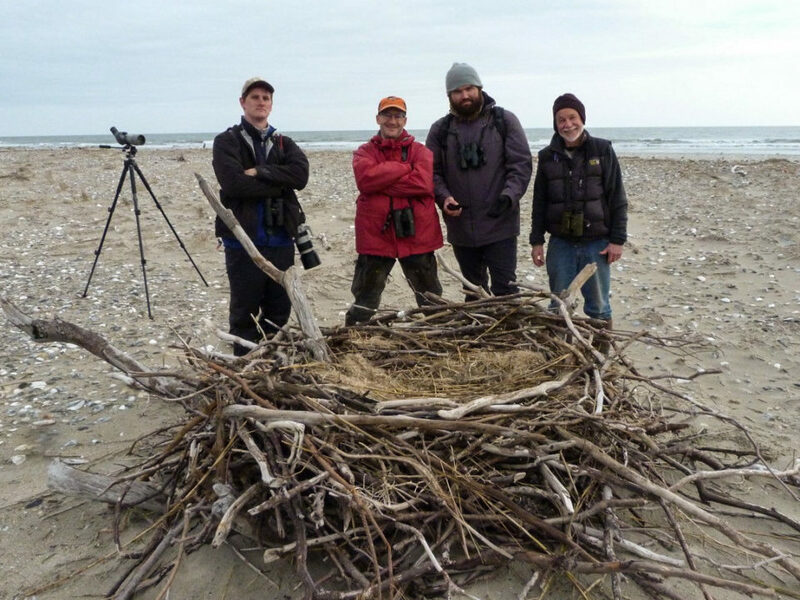 Within 3 years the bird established a new breeding territory on the Benjamin Harrison Bridge near Hopewell, VA, and produced 27 young over the next 10 years. On 12 February 2007 the bird was found dead near the bridge. Like so many other peregrines that we have tracked over time, the old male flew into a guy wire and was killed. 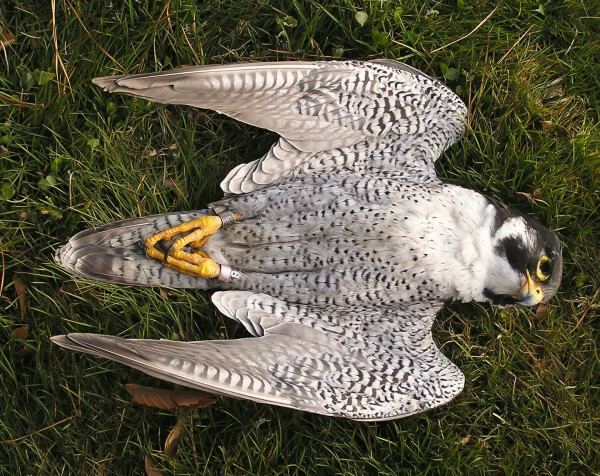 Male peregrine 3-8 was killed when it flew into a guy wire near its eyrie on the Benjamin Harrison Bridge in 2007. From tracking studies in Virginia we have determined that flying into structures like wires is one of the leading causes of mortality for peregrines. Photo by Bryan Watts. We kill billions of birds across the globe every year. Many of these birds are like 3-8, unintentional casualties of the infrastructure we have built to support modern society. They fly into hazards that we have erected in their airspace like tall buildings, transmission lines, radio towers, and wind turbines. They are poisoned by chemicals or soiled by oil spills. They become entangled in fishing gear or are hit by cars or trains or airplanes. Some are killed intentionally by hunters or by people who classify them as pests. 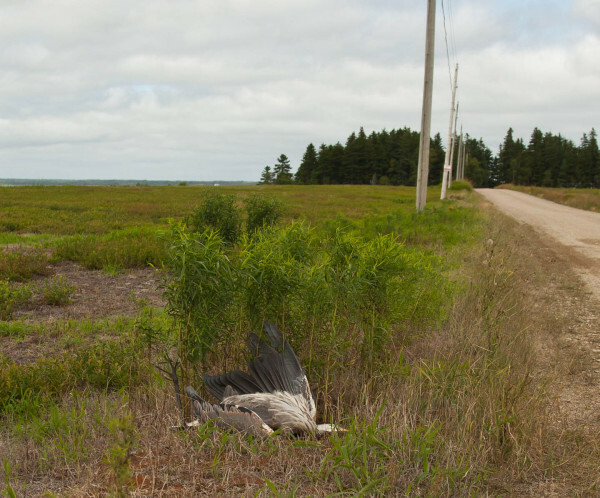 Great blue heron found dead under a roadside power line. Work by The Center for Conservation Biology and other research groups has determined that siting of power lines is the primary factor influencing strike-related mortality. Lines should be sited in areas away from primary flightlines. Photo by Bryan Watts. Two northern gannets tangled in a long-line fishing rig. 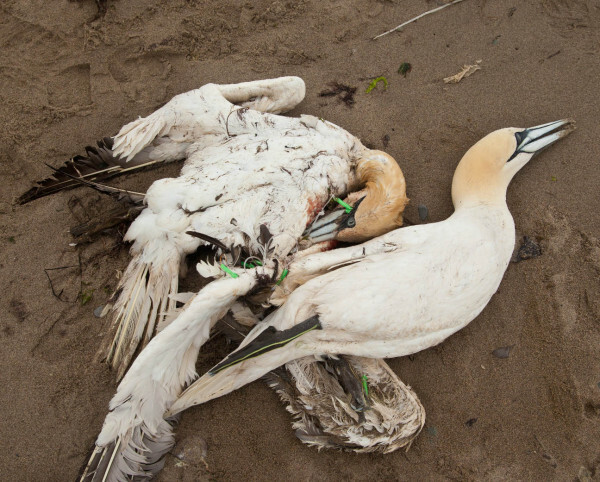 Fishing bycatch is a major source of mortality for seabirds throughout the world. Photo by Bryan Watts. Like with human mortality, we have spent considerable time and effort to quantify the major causes of death. In the United States alone, we estimate that every year nearly 60 million birds are killed by vehicles, 50 million are killed by communication towers, 70 million are killed by pesticides and possibly as many as 1 billion are killed when they fly into buildings. A recent study has estimated that free-ranging domestic cats in the United States kill more than 1 billion birds annually. Understanding mortality factors is an important step toward improving survival. However, mortality factors represent only one side of the story. 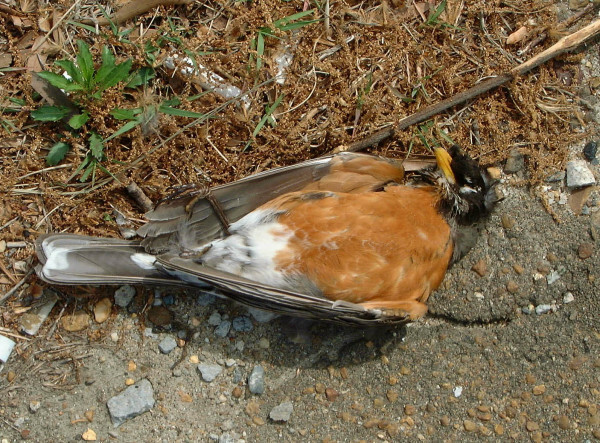 American robin hit by a car along a major interstate. Vehicle strikes are estimated to kill 60 million birds, including mostly passerines, annually in the United States alone. Photo by Bart Paxton. From a conservation perspective, the central question is not how many individuals are killed annually but whether populations have the capacity to absorb the mortality incurred and still reach management objectives. Understanding the relationship between realized mortality rates and sustainable mortality limits serves to focus management actions on factors that have the potential to cause population declines. Over the past several years, The Center for Conservation Biology has been borrowing from harvest theory to estimate sustainable mortality limits for species of conservation concern. 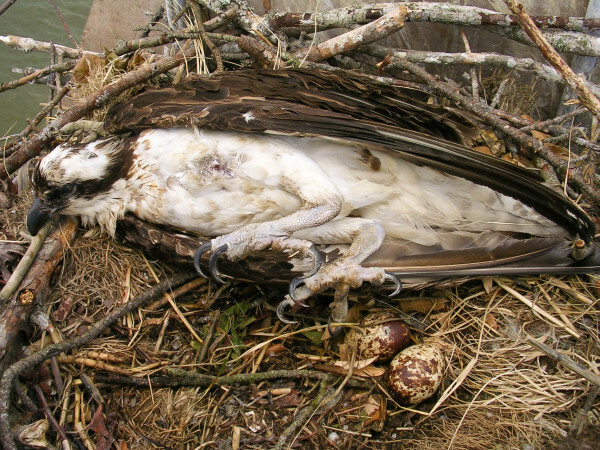 Female osprey shot on nest along the York River in Virginia while incubating two eggs. This type of indiscriminate poaching is illegal and has no place in modern society. Photo by Andy Glass. 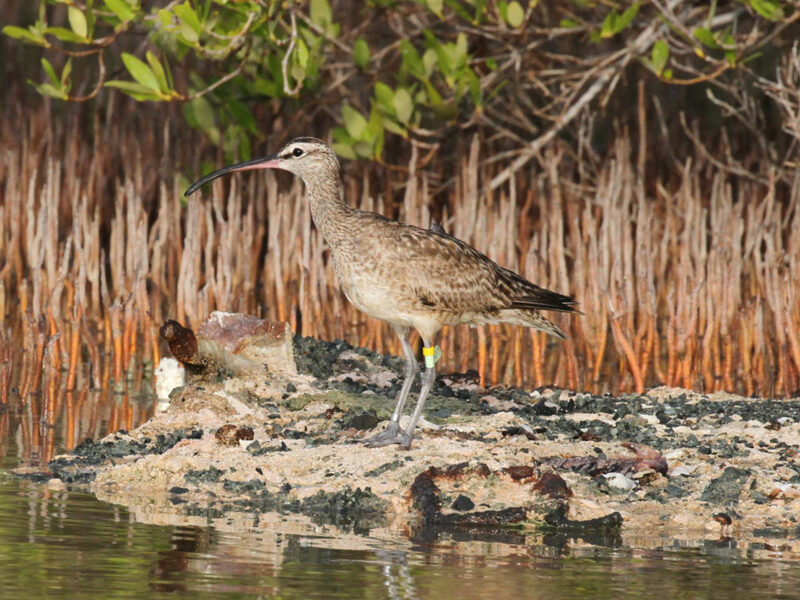 In 2010, CCB evaluated sustainable mortality limits for waterbird populations using the Western North Atlantic to provide a foundation for understanding potential impacts of offshore wind development (read Wind and Waterbirds). 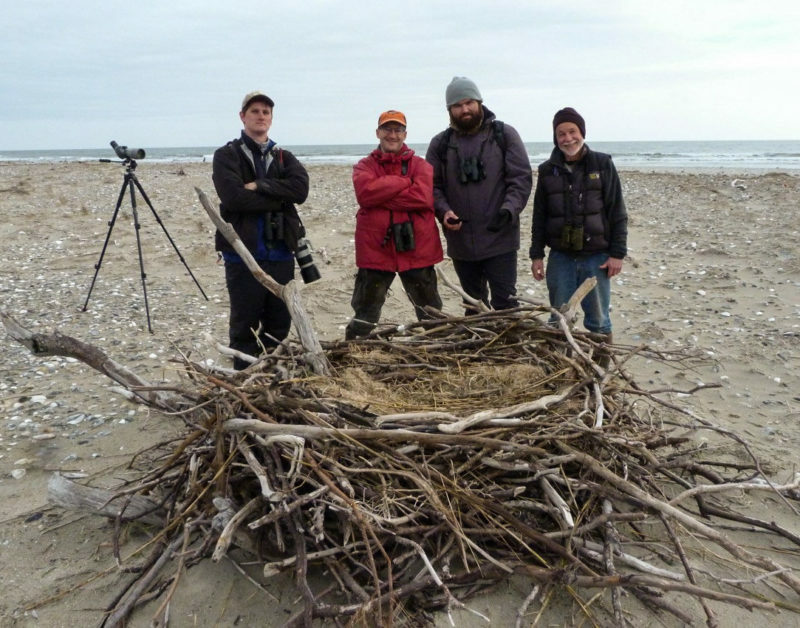 More recently, we have worked with the Canadian Wildlife Service and the U.S. 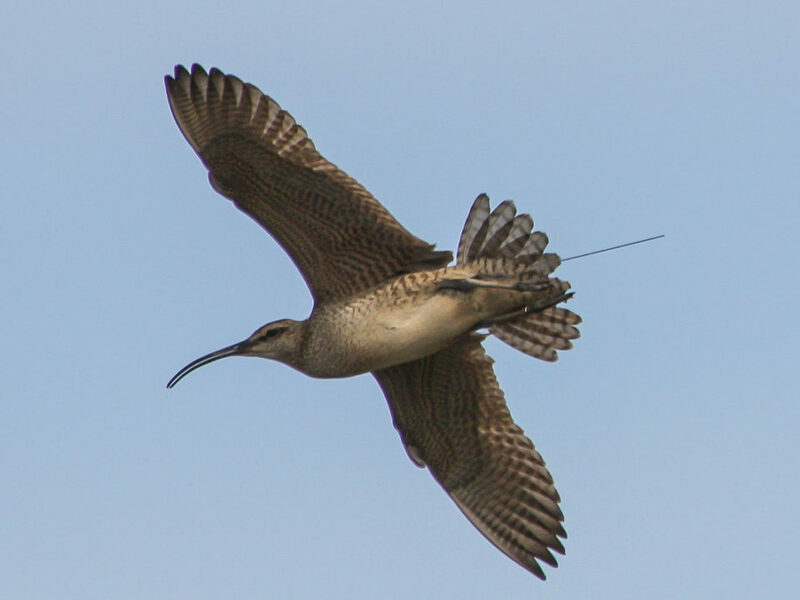 Fish and Wildlife Service to estimate sustainable mortality limits for populations of migratory shorebirds using the Atlantic Flyway to better understand the potential impact of shorebird hunting. A paper from this work will be published during the summer of 2015 and is now available online. 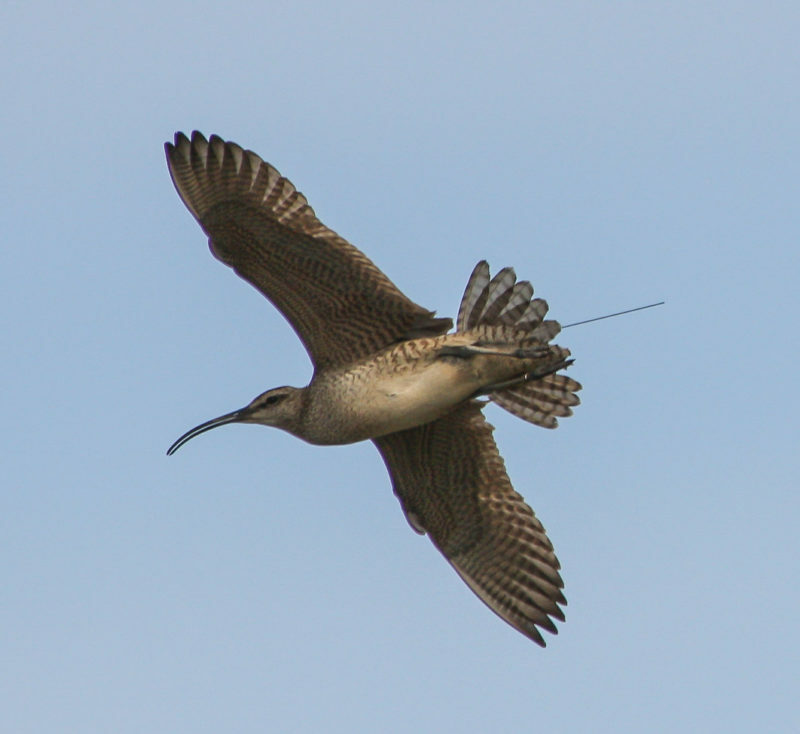 Following this effort, we have recently worked to estimate sustainable mortality limits for shorebirds using the East Asian-Australasian Flyway to better understand how hunting and other factors may be causing population declines. 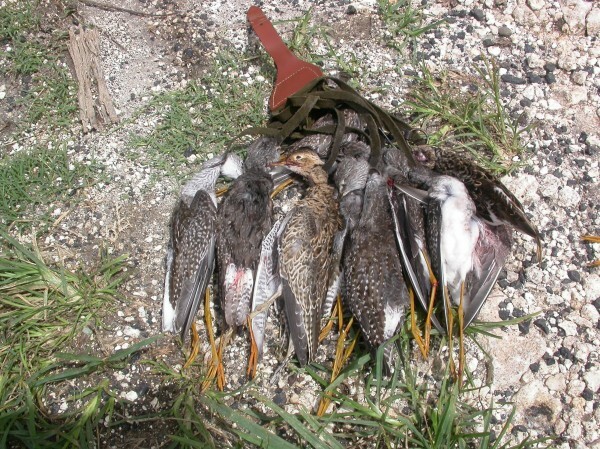 A “bag” of shorebirds from a hunting swamp on Guadeloupe. 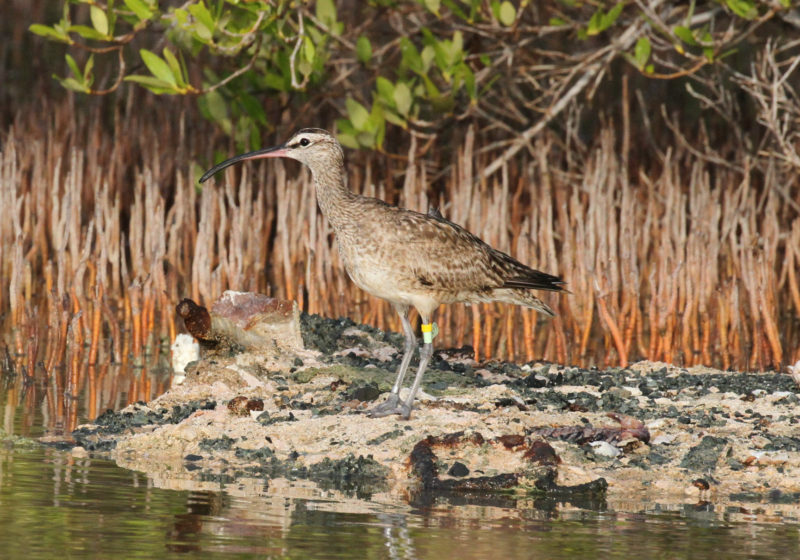 The Center has been focused on modeling mortality limits for shorebirds to better understand how hunting may be involved in ongoing population declines. Photo by Anthony Levesque.